If there's a game concept I'd like to see become prevalent, it's the one where you amass an army of little dudes to wail on much-bigger monsters. Pikmin. Overlord. Little King's Story. Only those three readily come to mind, and while my memory is surely failing me here by coming up short on examples, the point stands -- we could always use more of these games about strategic positioning. 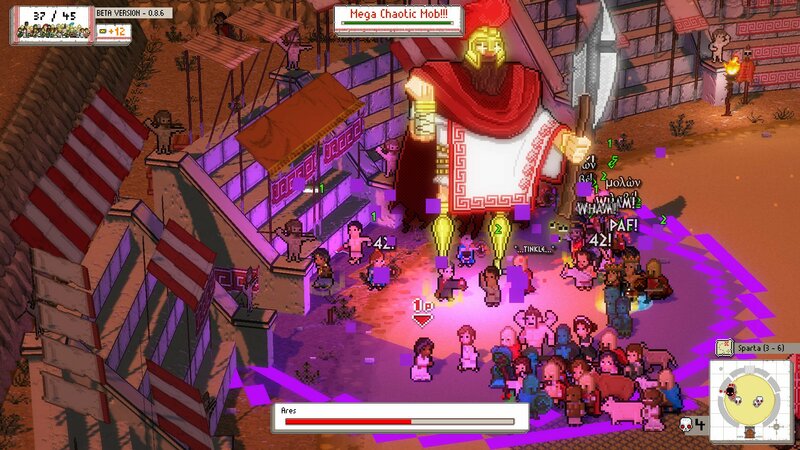 Okhlos is perhaps best described as a mythological mob simulator. 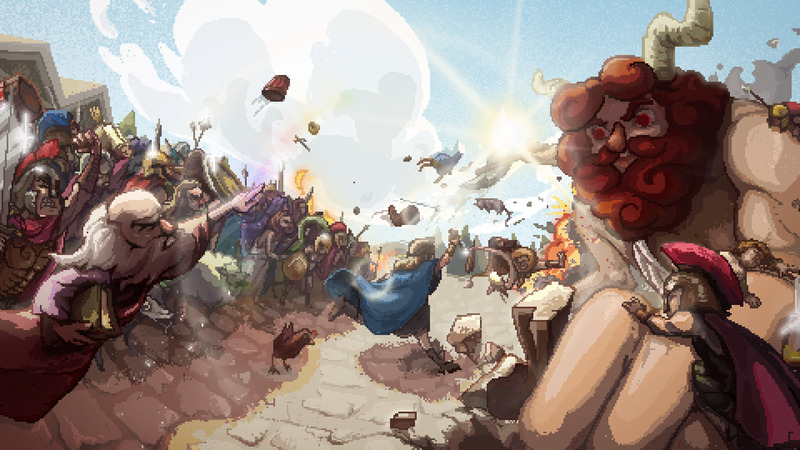 Controlling a philosopher in one hand (using the keyboard) and a growing crowd of soldiers, citizens, and animals in the other (using the mouse), you set off to beat the snot out of the gods and lesser beings from Greek mythology. Why? Because they're jerks! And the citizens have had enough! Now, I'm not sure how necessary it was to level houses and whole towns, but mobs and collateral damage do tend to go hand-in-hand. Instead of directly micromanaging individual units, you'll influence where the group goes by waving around a banner that your people will automatically flock to. You can issue some basic commands for them to attack, spread out, tighten up, or hold steady and block, but there's no fine control of this angry lot. The end result can be, well, chaotic. When you're trying to squeeze everyone around spikes, bombs, or the many other deadly traps scattered about, there will likely be a few casualties. On the flip side, sending a wave of bodies crashing down on a cyclops or a nymph has this great pop to it. That stays satisfying, which is good, because mechanically there's not a whole lot else to Okhlos. Each themed level is broken down into procedurally-generated areas with shops serving as pit-stops and a boss fight with a familiar god or beast at the end. You'll lose good people, pick up wandering replacements, and occasionally cash in certain types of mob members for others (e.g., item-carrying slaves for more powerful warriors) or claim stat-boosting heroes (like Daedalus or Antigone). The latter are especially key to your extended survivability. If your philosopher character falls in battle and you're fresh out of backups, that's the end of your run. Similarly, if you've burned through a whole mob and you can't seem to find any more warm bodies to build it back up, your fate is sealed. I found myself in the latter scenario more than the former, aside from times when a stray arrow struck down my leader or they got lost in the shuffle and took damage from a hazard. As far as I know, there are eight worlds to rampage through, but I can't for the life of me get past the seventh, Hades' realm. I've tried and I've tried, and right when a run seems to be going nearly without fault, I run up against a brick wall. A pair of bunched-up Hecatonchires (Hundred-Handed Ones) mash my mob to bits. Or I make it a fair way, up to Aphrodite, but she pits my people against each other and before I know it, the whole mob has been chipped away. I'll just let my philosopher die, I guess. Once your momentum slows, it's hard to pick it back up. 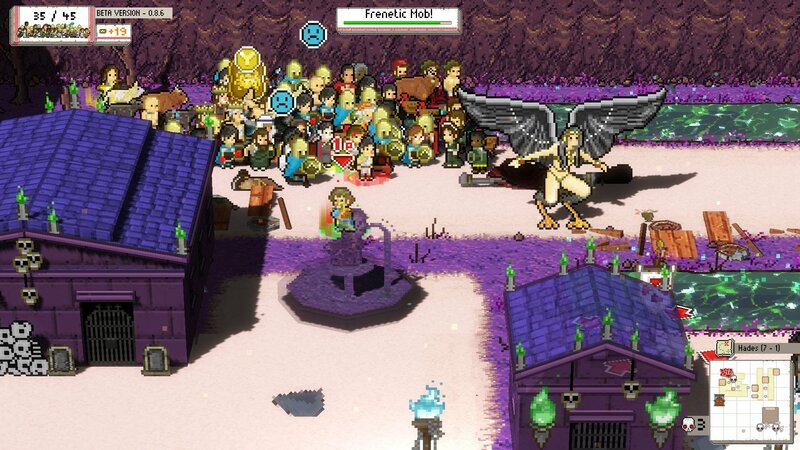 Okhlos doesn't provide ample opportunity for comebacks, and given how easy the game begins and how not-easy it eventually gets, that comes as a disappointment. I could only play the slightly-tweaked but largely same-feeling opening areas so many times before it felt like going through the motions. The expressive pixel artwork and wonderfully melodic soundtrack, while smile-inducing, couldn't keep me in good spirits forever. As much as I enjoy the tone of Okhlos and its silly but well-informed take on Greek mythology, its repetitive format and simplistic gameplay hook aren't an engaging combination. I'd like to see every little goofy reference it has to offer, but the motivation to push through the grind just isn't there.